Jason Zinoman of the New York Times praises Great Moments in the Theatre as "more a theater lover’s journal than a history lesson...it’s also a convincing argument for the importance of a long life in theater criticism...debate about plays can often be myopic and lacking the context necessary for real passion. I find it delightful, even inspiring, to read Mr. Nightingale discussing Shakespeare revivals with the argumentativeness of sports talk radio." Many legendary stage performances (Olivier's Henry V and Hamlet, Brando's Stanley Kowalski, Rex Harrison's Henry Higgins, to name just a few) have made their way to film versions and in some cases entire theatrical productions have been recorded. Nightingale believes, however, that nothing matches actually being there in person and the potential for "connection between actors and audience" gives live theater "a potency and therefore an importance denied to any electronic medium." Not limiting himself to the countless productions he has actually seen, Nightingale begins with the premiere of The Oresteia in Athens in 458 B.C. and reminds us that this original production was "quite a spectacle" with masks, paintings, trumpets, and terrifying snake-haired Furies. He then moves up the centuries to the comparatively recent Hamlet at London's Globe Theatre in 1601. In Richard Burbage, the first Hamlet, Nightingale sees an "intelligent, deft, measured...and surprisingly modern actor" accomplishing the daunting task of portraying an introspective character "on a stage thrust out amid the groundlings, sharing daylight with spectators perched in half-circles high above." Under these rowdy conditions, Burbage offered not "just anguished introspection" but an "intense debate with those watching him: should I be or not be?...while staying firmly in character." Though Nightingale starts with the long view, the majority of the productions discussed are from the British and American theater in his lifetime. Nightingale calls the post-World War II decades -- the years that witnessed the rise of Tennessee Williams and Arthur Miller, John Osborne and Joe Orton, Tom Stoppard and David Mamet, the National Theatre, the Royal Court, and the Royal Shakespeare Company "the most exciting period in our theatrical history since the Jacobean era." As to what constitutes theatrical greatness Nightingale says that great theater "can move you, exhilarate you, delight you, deepen you, transport you and your imagination to other worlds, tell you fascinating things about your and others' society, culture, history...It can be excellent or unforgettably bad or strikingly in between. It can doubtless be cathartic, whatever that means, and very occasionally it can be magical, whatever that means." An example of greatness without excellence is John Osborne's seminal Look Back in Anger which revolutionized British drama in the 1950s with the bitter rantings of its working class protagonist Jimmy Porter. Nightingale acknowledges that Anger is historically important but at the same time is "a formal, rather old-fashioned" work with a plot involving the "hoary subject" of martial infidelity. Rosencrantz and Guildenstern Are Dead, "the play that made Tom Stoppard's name" in the 1960s and one that is widely studied in British schools, is "a philosophically spurious, cute and whimsical rip-off" of Samuel Beckett's Waiting for Godot and inferior to Stoppard's "later, more exhilarating works, notably Jumpers and Arcadia." 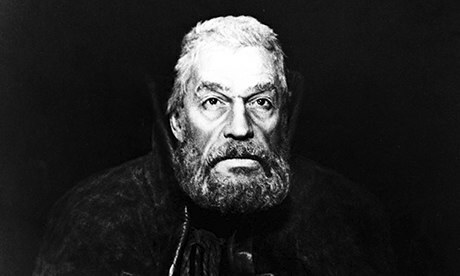 "Greatest actor" Paul Scofield as a "revolutionary"
King Lear, 1962 (photo/Ronald Grant Archive). Famous names and top drawer venues are plentiful among the Great Moments but not essential for a production to create magic. Nightingale recalls one of his most thrilling experiences as a theatergoer was delivered by a touring company's staging of Racine's Phedre at a North of England theater that was "actually a shabby old cinema with disintegrating seats and somewhere at the back of the quarter-filled stalls, a urinal which every few minutes flushed so loudly that an ugly whooshing noise carried through the audience." Despite surroundings that "couldn't have been more unfriendly to classical drama" what passed between the stage and spectators was "strange and almost unworldly." 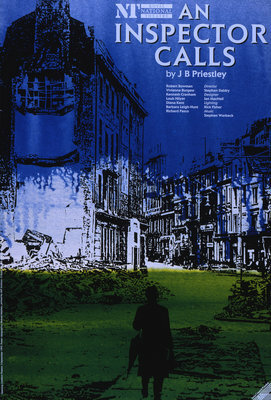 The most recent production discussed is Jerusalem by Jez Butterworth, presented at London's Royal Court Theatre in 2009, and starring Mark Rylance as a swaggering, opinionated, but ineffectual libertine living in a filthy "American-style trailer" and scratching out a living by selling his blood. "Rylance brilliantly embodied what Butterworth's marvelous play made clear: the remnants of an old, ribald, pagan England are sinking under the weight of twentieth-century 'progress,' and there's nothing we can do about it," Nightingale writes. Nightingale calls Paul Scofield, the dark and burly British actor remembered mainly for his Oscar-winning turn as Sir Thomas More in A Man for All Seasons, "the greatest actor of my lifetime...beside him John Gielgud lacked physical energy and a sense of danger, Laurence Olivier was wanting of soul and Ralph Richardson hadn't the versatility." Scofield's interpretation of King Lear, at the Royal Shakespeare Company in 1962, was "revolutionary" offering a "grizzled, savage, utterly unsentimental" Lear who "raged and bullied...only to end up discovering the humanity he'd always despised." a musical great in its awfulness, 1966. A handful of musicals earn a place in Nightingale's great moments and one of them -- Twang!, a disastrous, short-lived take on the Robin Hood legend by Oliver! composer Lionel Bart -- is included because it was so "memorably awful." Nightingale praises Schonburg and Boublil's Les Miserables as a "large-hearted epic not often found in our cynical, stingy times" that "has had me battling tears on each of the five occasions I've seen it." He counts among his personal greatest moment in the theater attending Les Mis' premiere at London's Barbican Theatre in 1985 and finding himself along with the rest of the audience "linked in some mysterious secular communion." He was among the few critics to give the show a favorable review. Nightingale says -- "Thank God I hadn't read the original book, or maybe I too would have been supercilious and sneery at the expense of a musical the audience itself clearly loved." Nightingale's admiration for Les Miserables led him to co-write with Martyn Palmer Les Miserables: From Page to Screen, a photo-filled book which covers the history of this international crowdpleaser from its inception to its 2012 film version. Other books by Nightingale include The Future of the Theatre: Predictions, (1999), Fifth Row Center: A Critics Year On and Off Broadway (1986), and Fifty Modern British Plays (1983). sangat menarik gan. bagus tempat nya juga. dan egk ketinggalan enak nyya. jangan lupa mampir di Agen Judi online terpercaya maxisbola piala dunia terbesar dan terpercaya. banyak permainan. dan hadiah nya smart phone keren. dan bonus hingga mencapai 100% tunggu apa lagi gan. mari merapat dan daftar kan diri anda. di tunggu ya gan.